Roasted Beet and Carrot Salad | Naturally. Too often I was finding myself rolling out of bed with thoughts of my to do list already quickening my step. I take the dog for a walk in a hurry, convince myself there is no time for yoga, and jump right in (because there is no time to waste!) What I realized, however, was my days weren’t going so well. It’s like if I didn’t mentally prepare myself for the day, I wasn’t ready for it. Too often I get in this mentally of “hurry, hurry, hurry.” In fact, ask M or anyone in my family and they would tell you that was my mantra (which is something I’m trying a bit to change- there are times to hurry but there are also many times for slowing down). So, I’m starting with my mornings. 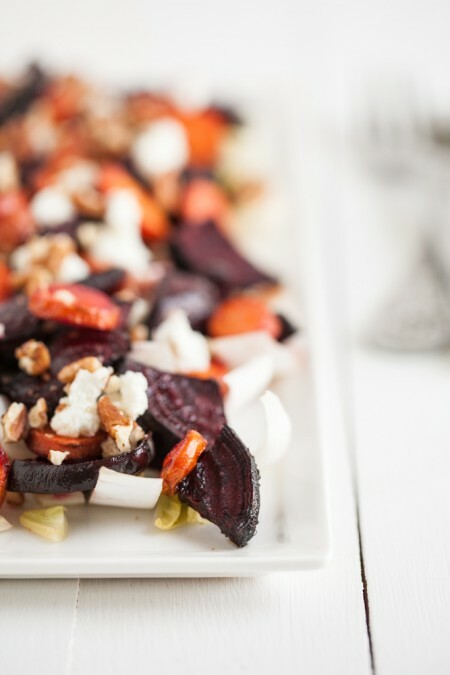 This recipe is simple and the flavors of the endives, roasted veggies, dressing, and goat cheese play really well together. I could see myself subbing out the endives for a more substantial salad base during the summer. Preheat oven to 450˚. On a rimmed baking sheet, toss beets and carrots with 1 tablespoon plus 1 1/2 teaspoons olive oil; season with salt and pepper. Roast in a single layer until tender, 25-30 minutes, tossing halfway through. Let cool 5 minutes. Meanwhile, in a small bowl, whisk together orange juice, vinegar, tarragon, and remaining 1 tablespoon plus 1 1/2 teaspoons oil; season with salt and pepper. In a large bowl, toss endives with half the dressing, then transfer to a serving platter. 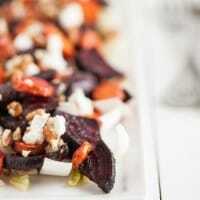 Toss beets and carrots with remaining dressing and add to platter. Top salad with goat cheese and pecans just before serving. *A quick note from when I whipped up this recipe. I didn’t peel the beets nor the carrots (a waste of time and good veg if you ask me) and I also chose to cube everything instead (a rebel, I know). *disclaimer: While I was provided with the cookbook free of charge through Martha Stewart, all thoughts and opinions expressed above are my own. Previous Post: « Love your Food. This is one of my favorite combos. Such a great morning practice to follow. I often forget to do this too, so thank you for the reminder. I generally do ten minutes of yoga every morning, but often find my mind slipping to other things (like what to make for breakfast, what I have to do today, etc.) during the practice. It’s good to start the day with simply a positive breath. Yum! I don’t do nearly enough with beets- that needs to change! I’m also with you on the hurry huryy hurry thing….I’m so bad. I tell my self to slow down, I made a huge canvas of inspiring quotes for my wall, I even blog about taking time out and showing gratitude…but I’m awful at actually following my own advice! Just wanted to say that last night I made your tostadas followed by your no-bake espresso cookies, and it was the perfect end to a completely cranky day. Thank you! 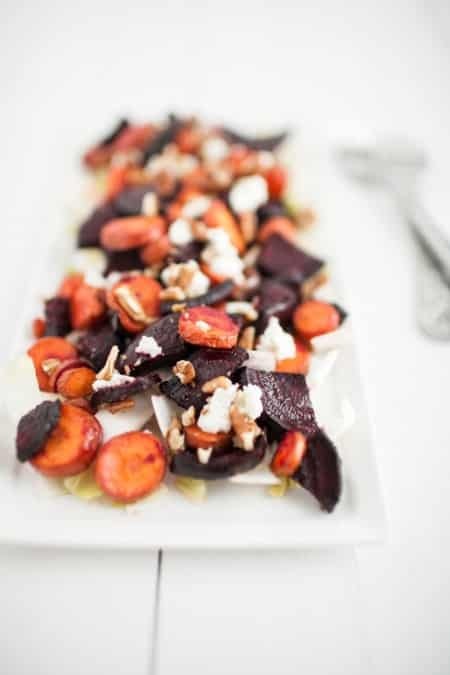 This salad is so beautiful–I love all the deep colors of the roasted carrots and beets. And the contrast with crispy bitter endive and rich cheese sounds perfect! Omg, I totally need to start saying that every morning! haha Also, this salad is totally rad. Beets make my heart “beat” with happiness…sorry, I had to!! This salad looks really scrumptious. I love the colors! Thanks for the tip about Martha Stewart’s new book. I’ll check it out. 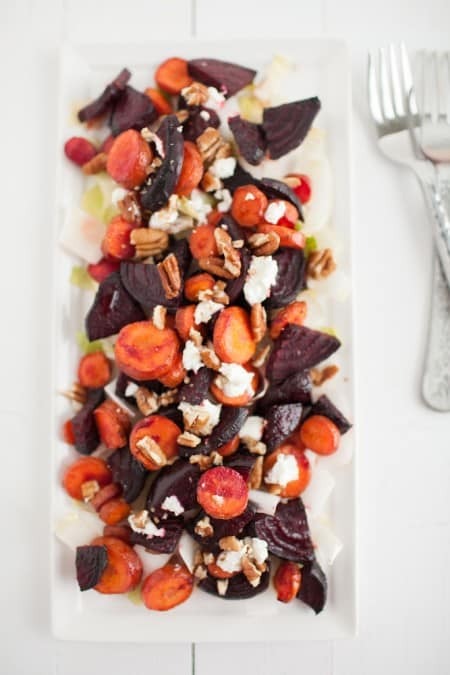 I love carrots and beets – roast them and add goat cheese, and I’m easily sold! I’m usually boring with my roasted veggies (if that’s even a thing), but adding a little extra like you did here looks fantastic! I like the recipe, thanks – it’s a nice find. I often think that Martha Stewart vegetarian recipes are a little dense but this worked well – I made another version with honey the night after trying this one and that was nice too. I don’t know if you’ve heard of him (he’s British), but my go-to celebrity chef is Yotam Ottolenghi 🙂 I’d love to hear what you think of his recipes – I love your blog, opinions on food and flair with veggies (which is weird because we’ve never met).